The government needs to stop leaving councils "in the dark" over Brexit and urgently provide more support, MPs say. 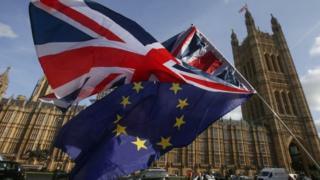 The Commons Housing, Communities and Local Government committee said ministers should prioritise making sure that EU funding will be fully replaced after the UK leaves the EU. Its report said plans for the UK Shared Prosperity Fund need to be fast-tracked to fill the gap. The UK is currently due to leave the EU on 12 April. The government has said that after Brexit it will replace EU funds for poorer parts of the UK with the proposed UK Shared Prosperity Fund to reduce inequalities across the country. Separately, it announced in January that local councils in England will receive £56.5m to help then deal with Brexit and for "appropriate contingency planning". How does Stronger Towns Fund compare with EU funding? The committee's report said the Shared Prosperity Fund "must match or exceed the equivalent levels of EU funding which is currently provided to local government". It called for the improvement of information sharing with local authorities - and urged ministers to set out how funding and powers can be devolved to councils after Brexit. Committee chairman Clive Betts also said the government had to address Brexit concerns raised by councils - such as potential road gridlock. The Labour MP called on the government to provide "reassurance" and "adequate financial support". "It is also absolutely imperative that the government now brings forward its plans for replacing the EU funding that some of the poorest communities across the country currently rely on," he said. "If they want to ensure that local authorities face the challenges and seize the opportunities of Brexit they cannot keep leaving them in the dark." The committee said the money made available under the UK Shared Prosperity Fund should be in addition to the money already announced for the Stronger Towns Fund. It said the government also had to ensure a "comprehensive range of planning, guidance and support" was in place in the event of a no-deal Brexit. "The government must take steps to address workforce shortages in the short term, ensuring EU nationals working in the UK are made aware of and encouraged to apply for settled status," the report said. The Local Government Association's Kevin Bentley said councils were facing "resource, information and advice gaps". "In the longer term, Brexit cannot result in swapping Brussels for Whitehall," he said. "Devolving powers to local communities through local government must be on the agenda and we will be pressing hard for this post-Brexit." A spokesman for the Ministry of Housing, Communities and Local Government said: "The select committee recognises the government's work to help councils prepare for Brexit and we continue to engage with them so they are kept well-informed. "We have updated national guidance to support them with any decision-making they may need to take and are also providing over £58 million to ensure they can provide their communities with the support they may require." Stronger Towns Fund: How does it compare with EU funding?